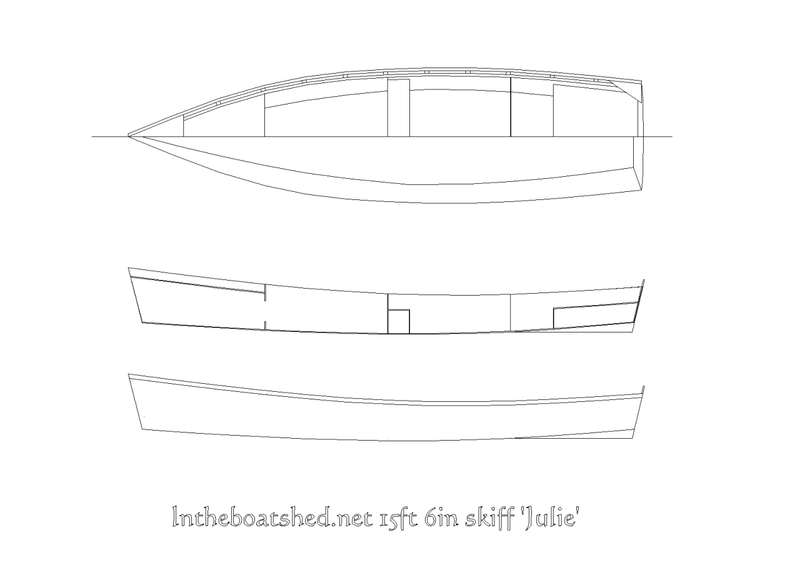 Julie – a flat-bottomed 15ft 6in skiff from intheboatshed.net. As usual, click on the image for something much bigger! 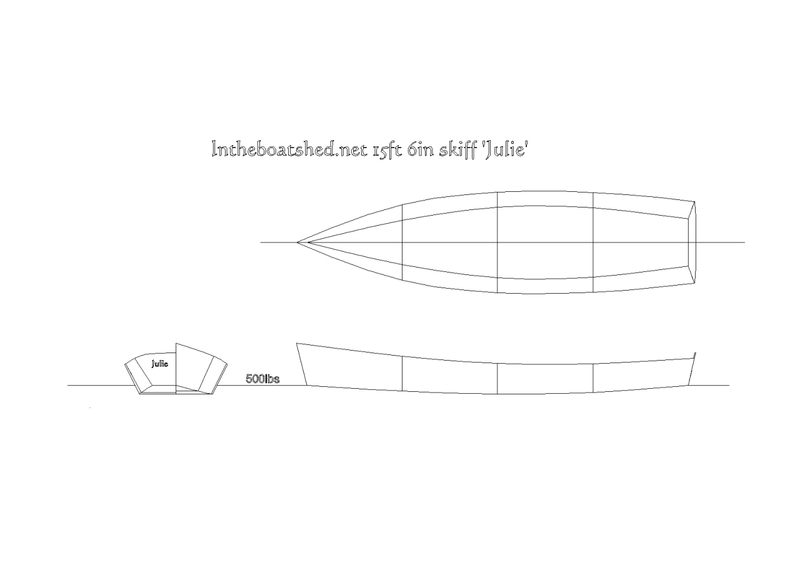 This is the easy-to-build stitch and glue version of the Julie skiff, named after my partner. A more challenging traditional version is to come later, but meanwhile I think this straightforward s&g build should appeal to many first- and second-time boatbuilders. She has a good hull that will row nicely, and has been laid out for convenience and easy construction with the number of parts reduced to a minimum consistent with a strong, rigid structure. In this post you can see that I’ve made some significant progress towards completing the plans, but the next big job, of course, is to map out the panels, which I intend to do in the next few days. I’d be delighted to hear from anyone out there who is interested in this project. A question from a reader has prompted me to explain the foredeck detail. It’s not meant to be used as a seat, and I’ve placed it 3in below the sheerline partly because I think it looks nice but also because it provides somewhere to keep a mooring line and maybe a small anchor. I haven’t drawn them yet, but the idea is to have two drains to open water at the wide, aft end of the foredeck area. First i will introduce my self. And i life in the Netherlands. Your plans look very good and when i have time i try to build it. Bud the plans are not available in metric that is a pity. So the people in Europe must calculate everything to metric. I hope that the plans also in the future are available in metric. And i am a first time builder. my age is 56 years. I’m sorry there are no metric measurements. Even today, most home boatbuilders in the UK and the USA prefer Imperial measurements to metric, and I simply have not had time to do any metric measurements. Can you work in inches and fractions? I imagine it must be easy to buy a tape measure or scale via the Internet and working in 1/8 inch is not so difficult. Don't be put off. When I built the light Trow I also came up against this problem, you might remember, Gav, that I asked you for the measurements in metric, and I went as far as buying an imperial tape measure. But I didn't want to have to translate measurements every time I went to the hardware store. The solution turned out to be easy. I opened the zip file with the program freehand on a mac and could read off the measurements in imperial or metric as I wished.